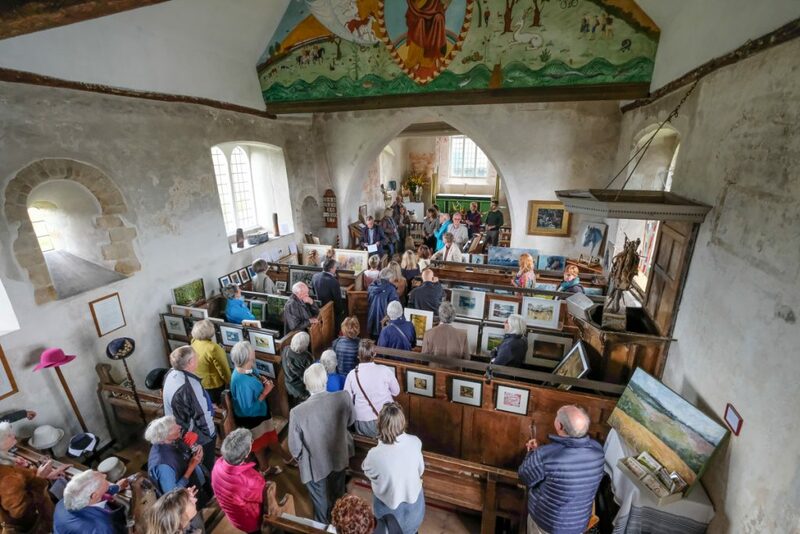 An estimated 800 visitors made the journey up the hill to ‘the little church in the field’ over the course of the 16th and 17th September weekend, 2017. 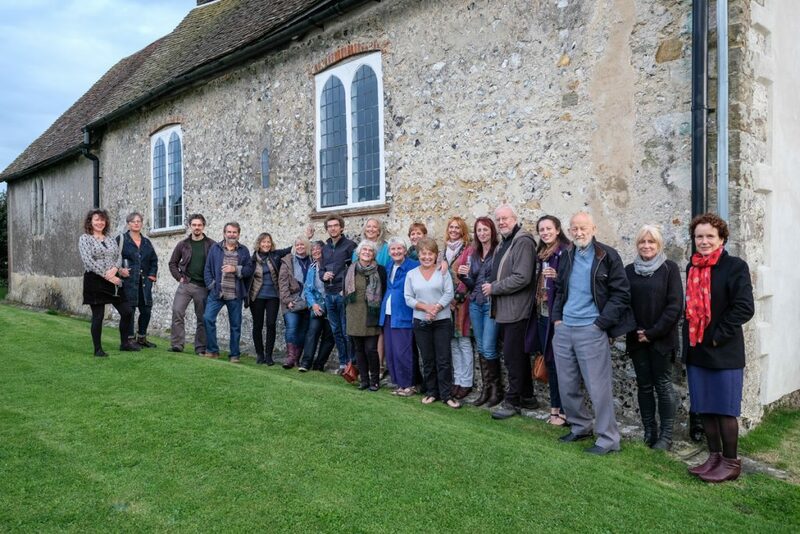 The exhibition entitled, ‘St Hubert’s Idsworth: An Exhibition Inspired by its Heritage and The South Downs Landscape’ was co-ordinated by local professional artist, Deborah Richards. 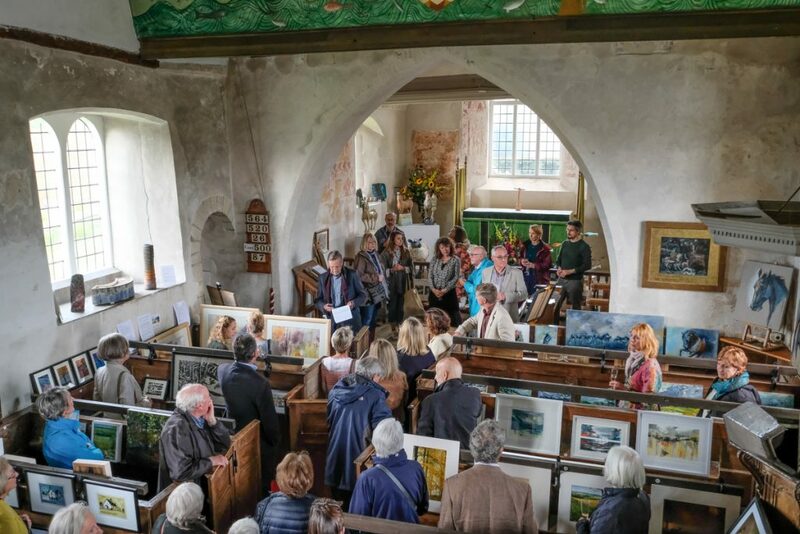 Under her influential and watchful eye, Deborah was responsible for bringing together a wonderful array of high quality work submitted by over thirty local and professional artists. 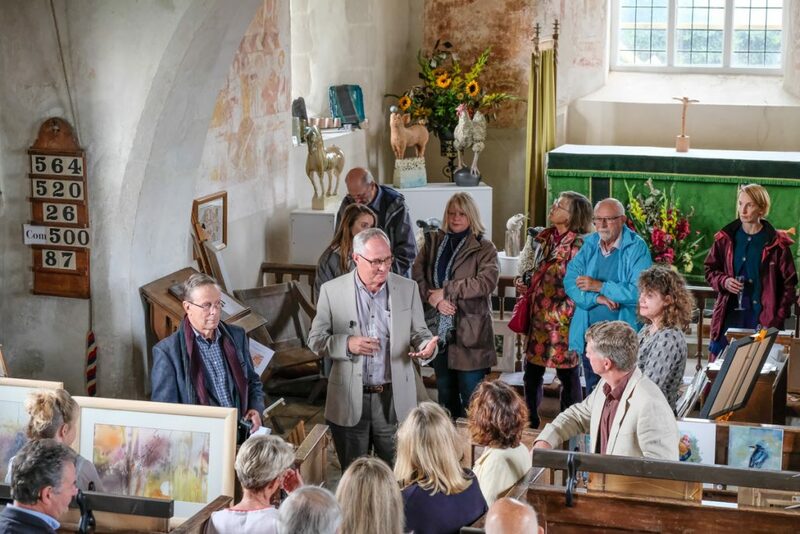 Themed paintings and drawings, prints, photography, textile, ceramics, glass, metal and other 3D sculptures in various mediums, pottery and ceramics contributed to a highly engaging show. 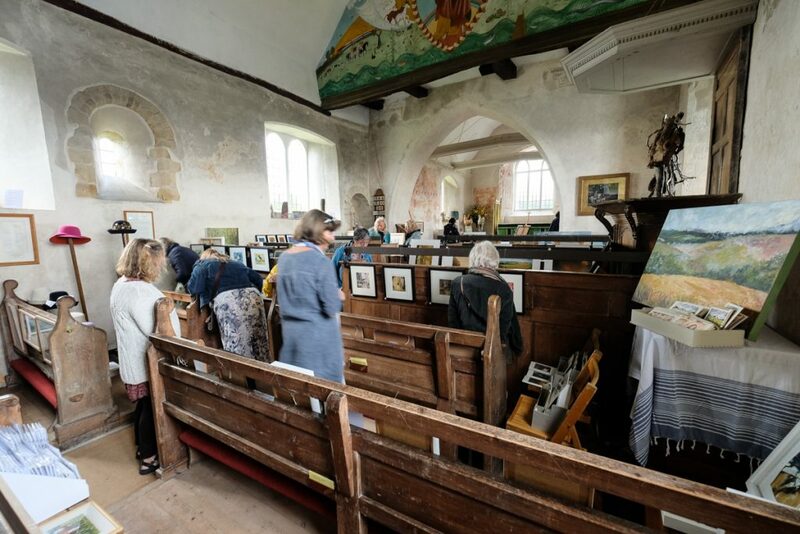 Most artists showed an individual exhibition in the box pews. 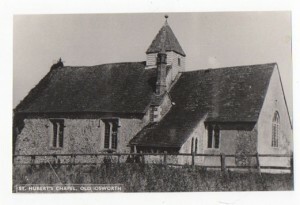 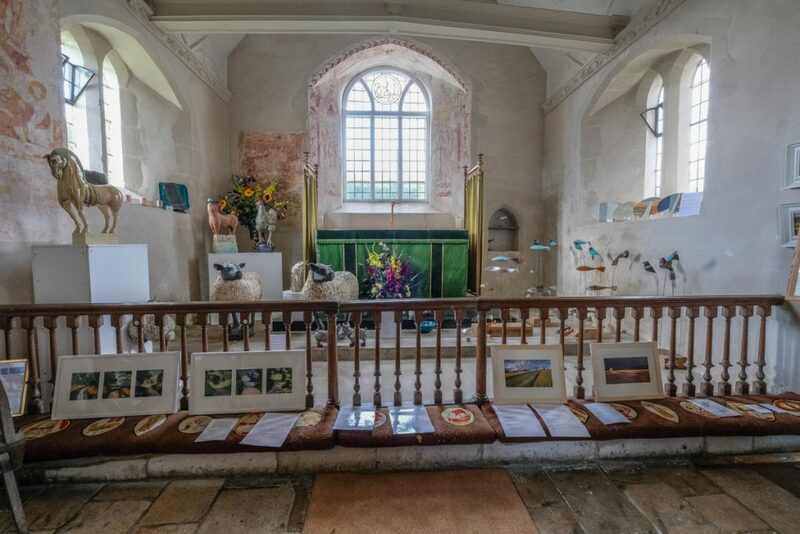 Within this varied exhibition, there were life-sized ceramic sheep and chickens in the Chancel, a life-sized driftwood horse’s head in the pulpit, expressive oil paintings of the South Downs, atmospheric photographs, prints and textiles based on the murals and fabric of the building, wood engravings, lino prints and semi-abstract landscapes of the local area. 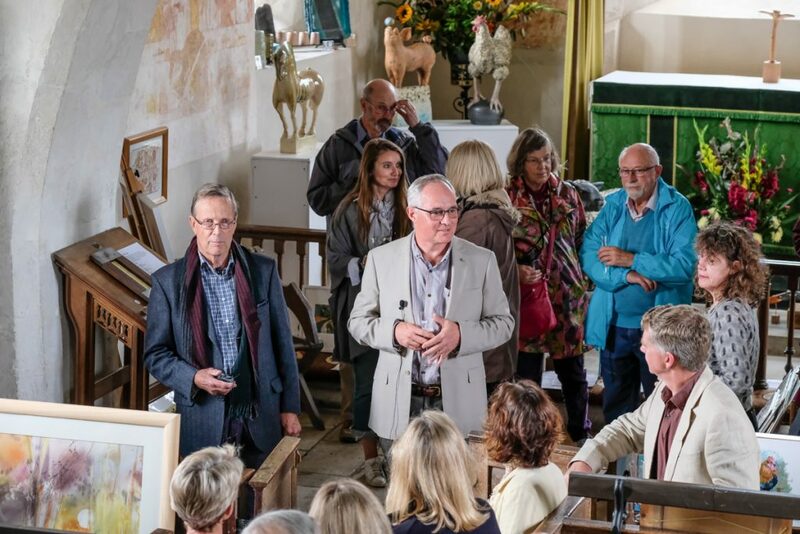 The event began with a private viewing attended by 100 people on the Friday evening: after a few words of welcome by Roger Walker, Chairman of The Idsworth Church Friends Trust, the exhibition was officially opened by Mr Andrew Lee, Director of Countryside and Policy Management for the South Downs National Park. 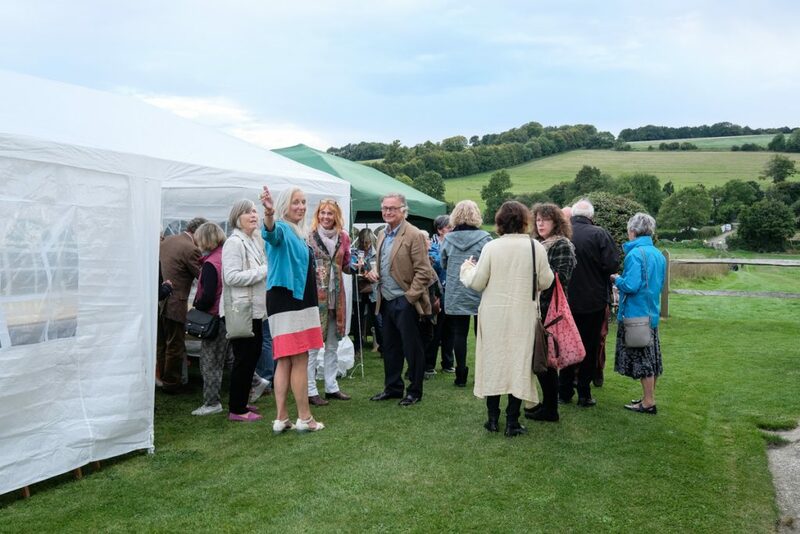 The wet weather on the Saturday afternoon did not dampen the enthusiasm and there was always a cup of tea and piece of cake available in the refreshment tent. 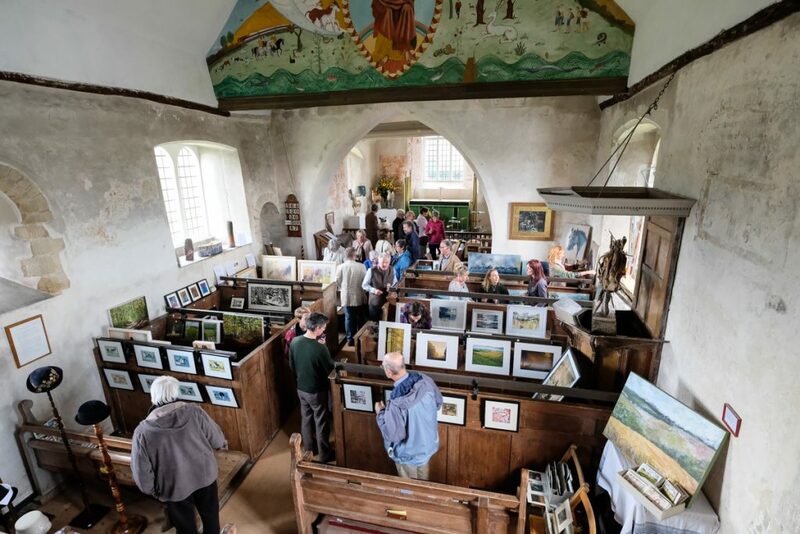 The sunshine returned on the Sunday: not only were visitors able to enjoy the superb display of Art but also the wonderful views and countryside of the Idsworth valley within the South Downs National Park. 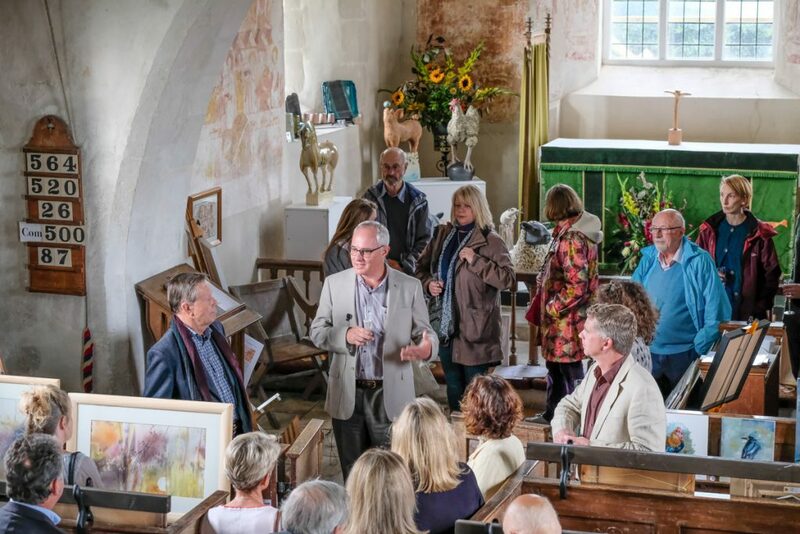 Roger Walker considered the event a huge success and was particularly pleased that a large proportion of the visitors had got to know the church for the first time. 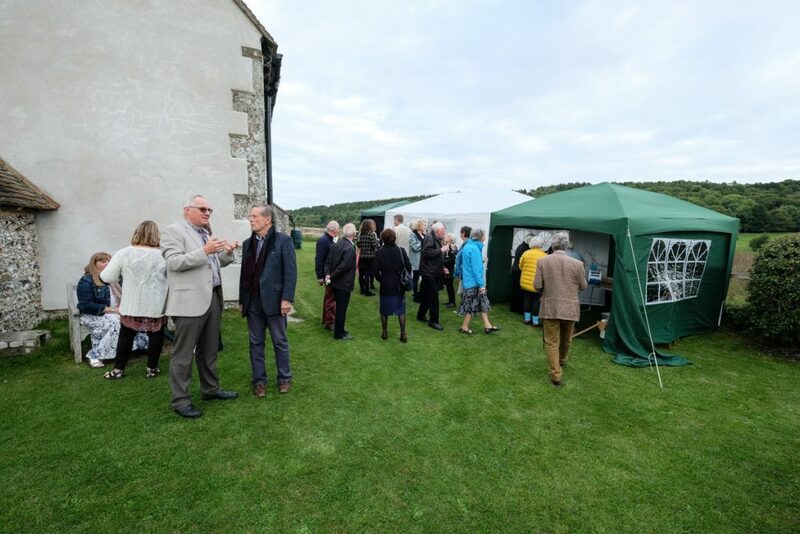 Some £1200 was made in the refreshment tent and Friends stalls; contributions from the sale of art work meant that a splendid total of £2,693 was achieved. 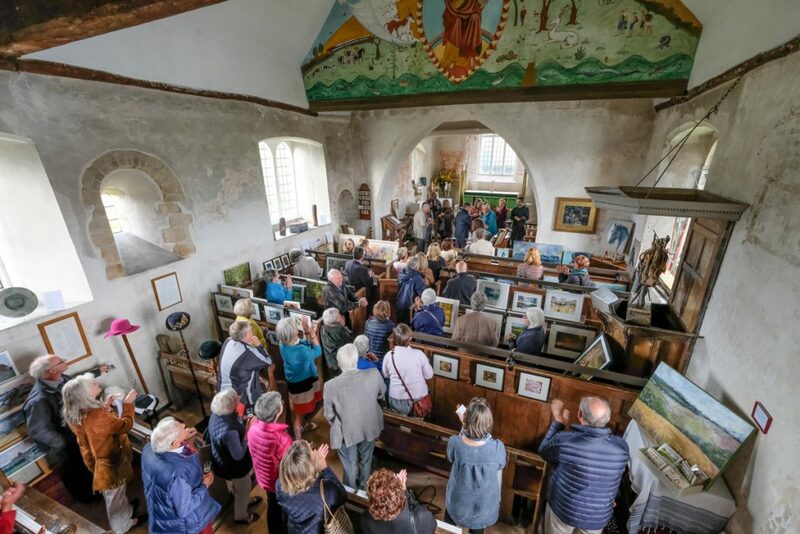 The Art Exhibition, another in a series of Friends events for 2017, has helped to ‘spread the word’ about the work of the Friends Trust and its aims to repair and safeguard ‘the little church in the field’ for future generations to enjoy. 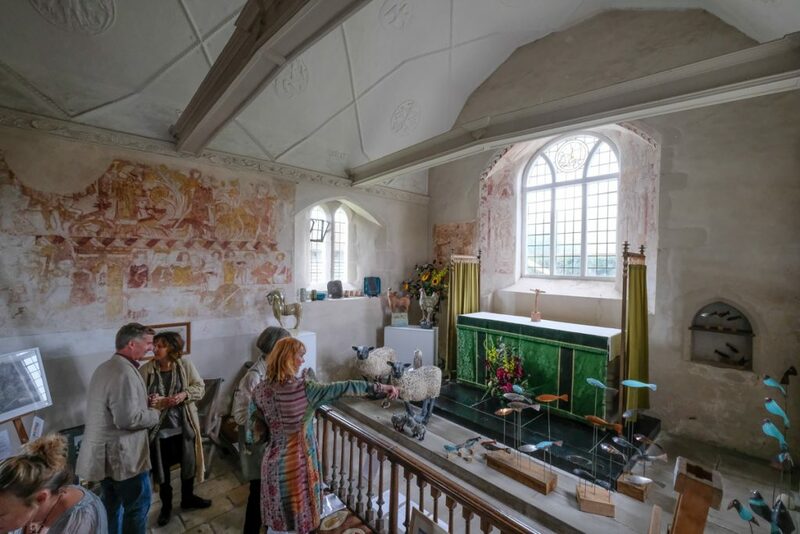 One visitor wrote: ‘A very high standard of work in a perfect setting’. 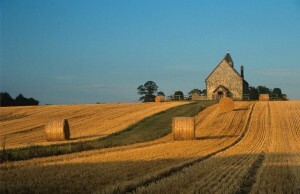 Another commented, ‘Stunning and beautiful, the church and artists compliment one another. 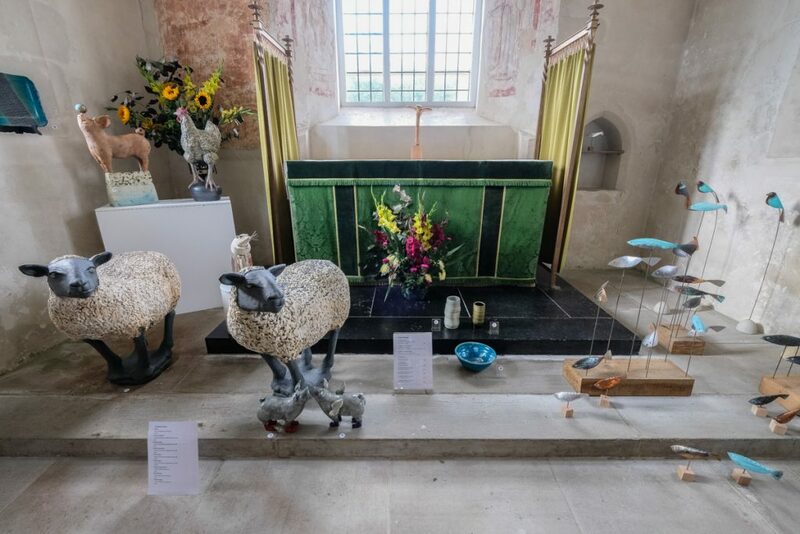 Please do another exhibition next year’! 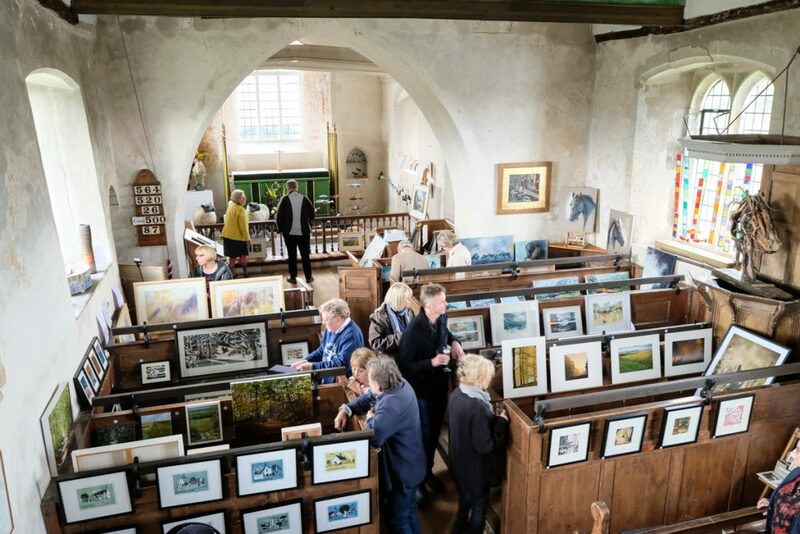 Well, the good news is that the 2018 Art Exhibition at St Hubert’s will be held over the weekend of 15th & 16th September, so put the dates in your diary now!